The University of Delaware is committed to the success of women in engineering. Our efforts to increase diversity in our College of Engineering were discussed in a recent Q&A. In honor of Women’s History Month, here are just a few of the women who set the course for the engineers of today and tomorrow. The first woman to major in engineering at UD, she graduated with a bachelor’s degree in electrical engineering. She later wrote: “Because I was the only girl studying Electrical Engineering, and a freshman, they didn’t know what to do with me. Most of the girl’s my age were taking courses for teaching school. My courses demanded a lot more study hours and ‘hands on’ work in the engine lab, so they put me in a girl’s dorm for juniors and seniors.” She worked in the research department at United Aircraft, now Pratt & Whitney, was set up by a coworker on a blind date with Harry Megson, got married, and ended her engineering career to raise her five children. She passed away on Feb. 12, 2018 at age 92. The first woman to graduate with a degree in civil engineering from UD, Rose was the top student in her class and later married a fellow Blue Hen, Norm. She later worked at Philadelphia Electric and Luken Steel. 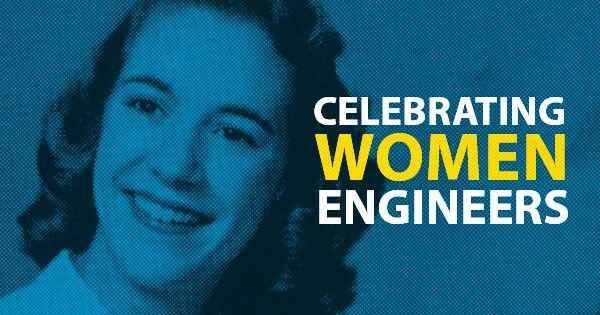 The first woman to graduate with a chemical engineering degree from UD, she later worked at the Patent Office in Washington, D.C.
After earning a master’s degree from Rice University, Sandra joined UD as an instructor of statistics and computer sciences. After earning a doctoral degree in computer science at UD in 1985, Carberryjoined the faculty full-time, won the UD Excellence in Teaching Award in 1993, and served as chair of the computer science from 1999 to 2004. She still teaches classes regularly as an emeritus professor. The first woman to receive a doctoral degree in chemical engineering at UD, her thesis focused on “Chemical Oscillations and Flickering on Catalytic Wires.” She now teaches at the University of Pennsylvania, and she is the co-founder and CEO of a consulting firm focused on risk management. This civil engineer earned her master’s degree and bachelor’s degree at UD. Now a senior research civil engineer with the U.S. Army Corps of Engineers Cold Region Research and Engineering Laboratory, she serves on the United States Arctic Research Commission. Kelly, who is vice chair of UD’s Board of Trustees, graduated from UD with a bachelor’s degree in mechanical engineering. The president and CEO of W.L. Gore & Associates, she will retire later this year. In 13 years at Gore’s helm, she has been recognized for pioneering a non-hierarchical culture. A longtime professor of math at UD, Cook agreed to devote half her time to the College of Engineering to bolster efforts to recruit and retain female faculty. Now Unidel Professor of Mathematical Sciences and associate dean of engineering for faculty, she is a faculty advisor of UD’s Women in Engineering group and principal investigator of the UD NSF ADVANCE IT (Institutional Transformation) grant, which focuses on fostering an inclusive campus climate for faculty. Promoted to Distinguished Professor of Materials Science and Engineering, Galvin became the first woman in UD’s College of Engineering to receive an endowed named professorship. She is now the dean of the College of Science at the University of Notre Dame. Karlsson, then an associate professor of mechanical engineering, became the first female chairperson of a UD engineering department. Now she is the dean of the College of Engineering at Cleveland State University. With her promotion to full professor, she became the first female faculty member who started as an assistant professor in UD’s College of Engineering and was then promoted to associate professor and full professor within the college. She is now the Catherine and Henry Boh Professor of Engineering and professor and department chair of the Department of Chemical and Biomolecular Engineering at Tulane University. She became the first female director of UD’s Center for Biomechanical Engineering Research, an interdisciplinary center with a mission to provide engineering science and clinical technology to reduce the impact of disease on the everyday life of individuals. Higginson’s research focuses on improving the understanding of muscle coordination for normal and pathological movements, which she investigates using experiments and simulation studies. In 2010, Higginson became the founding director of UD’s biomedical engineering program. She coordinated the undergraduate program through 2013. Doty joined Pam Cook to further develop the work being done through ADVANCE. She is currently co-principal investigator on UD’s NSF ADVANCE Institutional Transformation grant. An assistant professor of mechanical engineering, Doty is also faculty advisor to the Women in Engineering Graduate Student Steering Committee. This professor of computer and information sciences joined UD as the Edward G. Jefferson Chair and Director of UD’s Center for Bioinformatics & Computational Biology. For the last four years, she has been in the top 1 percent of the most cited researchers on Web of Science. Named deputy dean of the College of Engineering, Kiick has served in multiple administrative capacities for the College, including oversight of research activities, support of interdisciplinary graduate programs, and cultivation of industry and community engagement. Kiick joined the College as an assistant professor in 2001 and conducts internationally respected research in the area of biopolymeric materials. In 2017, she was named a Blue & Gold Distinguished Professor of Materials Science and Engineering. Kiick is also the first female in the history of COE who was promoted from assistant to associate to full to named professor, all at UD. Elliott came from the University of Pennsylvania and joined UD as the founding chair of the biomedical engineering program, which became a department and received national accreditation four years later. In 2017, she was named a Blue & Gold Distinguished Professor, and this year, she will be inaugurated as president of the Biomedical Engineering Society. Elliott, an expert in musculoskeletal biomechanics, investigates function, failure, and repair of tendon, meniscus, and discs. When she became chair of the computer and information sciences department, she was the third female department chair in College of Engineering history. A faculty member at UD since 1985, McCoy is a leader in accessible computing, natural language generation and understanding, and more. Her work developing assistive technology for people with disabilities has been nationally recognized, and she is a consultant for the National Institute on Disability, Independent Living, and Rehabilitation Research. Named associate dean for diversity, Davidson is implementing a structured diversity initiative to attract and retain talented students and faculty members from a rich variety of backgrounds. Multiple working groups and committees are studying key issues and developing resources to improve diversity across the College of Engineering. A professor of civil and environmental engineering, Davidson studies natural disaster risk modeling and civil infrastructure systems and received a grant from the National Science Foundation to study power and water shortages after natural disasters. The first female chair of civil and environmental engineering, she joined UD as a professor in 2005. McNeil studies infrastructure and transportation and directed UD’s Disaster Research Center from 2007 to 2010. She directed UD’s Disaster Science and Management Graduate Program from 2009 to 2016. Pollock is internationally known for her contributions in software engineering research, particularly in the area of analyses for software evolution and testing. Pollock, an advocate for computer science education and broadening participation in computing at every level, including K-12, is now leading efforts that focus on professional development for computer science teachers, providing CS access to minoritized youth in their communities, and supporting UD faculty in integrating computational thinking into discipline-specific courses.